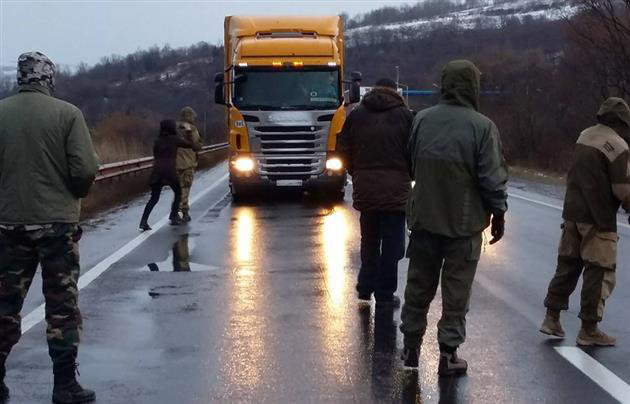 “Patriotic” Ukrainian activists have launched a campaign to prevent Russian trucks from passing through the Transcarpathian Region in the west of the country en route to Slovakia and Hungary. Russian haulers began using routes through the region after Poland closed its borders to Russian trucks. Local activists in the Transcarpathian Region in Western Ukraine have announced a campaign to bar Russian truckers from passing through the region on their way to Slovakia and Hungary. The action began on the evening of Feb. 11 near the village of Nyzhniye Vorota, according to the Mukachevo.net news website. The far-right movement Pravy Sektor (Right Sector), which is also involved in the blockade, explained that in Nyzhniye Vorota there is a traffic police checkpoint which is impossible to pass for those who are moving toward the border of Slovakia and Hungary from Kiev, writes the Kiev publication Apostrophe. Activists explained the interest of the Russian carriers in this area with the fact that Poland and Russia have been unable to extend an agreement on cargo transportation, as a result of which truck drivers are choosing new routes. One of the participants, Taras Deyak, told Mukachevo.net that while some Russian trucks were "immediately turning around” in sympathy with what was happening, others were protesting and arguing that politics should have nothing to do with them. According to the news website, there is no congestion, and Ukrainian and European trucks are passing unhindered. Oleh Tyahnybok, president of the radical party Freedom, confirmed on Facebook that the campaign to block Russian trucks involved party activists from the Western Ukrainian regions of Transcarpathia, Volyn and Bukovina. A correspondent for the publication 112 Ukraine later reported that the Domanovo checkpoint in the Volyn Region had begun to deny entry to Russian trucks. First published in Russian in RBK Daily.